SEW Eurodrive – Drives for every industry! Our extra-slim parallel shaft helical gearmotors are the perfect solution when space is limited. The many different sizes and designs ensure that the gearmotors can be used in a wide variety of applications even under the most unfavorable conditions. 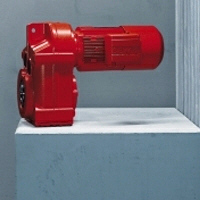 SEW-EURODRIVE parallel shaft helical gearmotors are typically used in conveyor and materials processing applications. You can choose from foot-mounted, flange-mounted or shaft-mounted options. Reduced backlash parallel shaft helical gear units are also available on request for precise positioning tasks. Purchase your SEW Eurodrive Parallel Shaft Helical Gear Motor F series today!